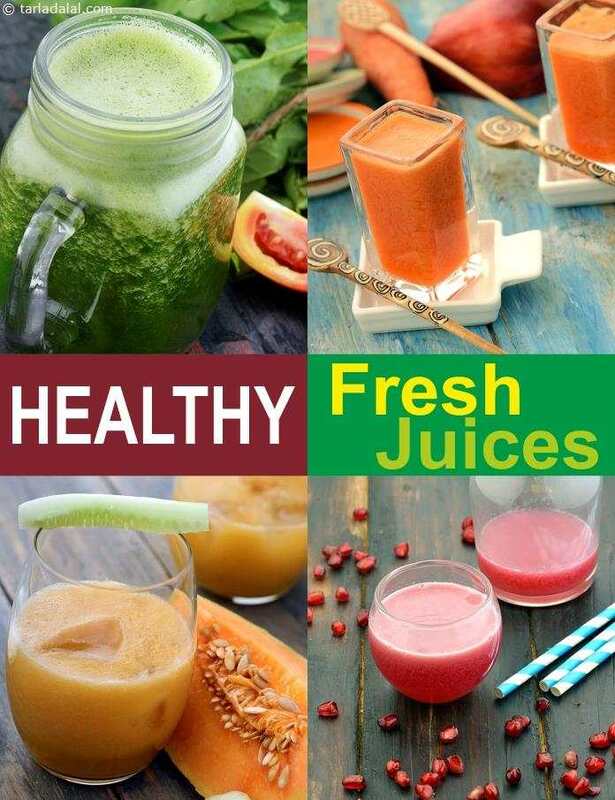 Healthy Juices, a great way to stay healthy. Fresh juices! Ah…the name itself is so refreshing, and these juices fit conveniently into our hectic schedules too! Here are some nutrient-packed juices, which you can include in your day-to-day diet. Various combinations of natural ingredients like fruits and vegetables are used innovatively to come up with tongue-tickling juices. Delightfully free from additives, synthetic colours and sugar, these fresh juices will leave you refreshed, and also answer your hunger pangs in a healthy and 'fruitful' way! Turn to freshly made juices to consume a healthy portion of vegetables/ fruits daily at one go. For example, one cup of carrot juice is approximately equivalent to four cups of raw chopped carrots. I am sure a glass of juice early in the morning or anytime of the day can easily fit into our busy lifestyles. Although eating fruits and vegetables in their natural state does provide us with a substantial amount of vitamins and minerals, juicing benefits us equally. It is true that some amount of fibre is lost while juicing in a hopper and by the process of straining after juicing in a juicer. However, the digestive enzymes and the nutrients are retained in the juice, which are easily absorbed by our body. Remember, despite the fact that juices provide us with a quick and easy way to increase our nutrient intake, do make it a point to include whole fruits, vegetables, whole grains and legumes in your daily diet. Juices and Drinks is the way to go!